A year after Pope Francis released his encyclical on the environment, Laudato Si’, Catholic adults in the United States are generally more likely to be concerned about climate change than other Christians according to a new survey conducted by CARA. 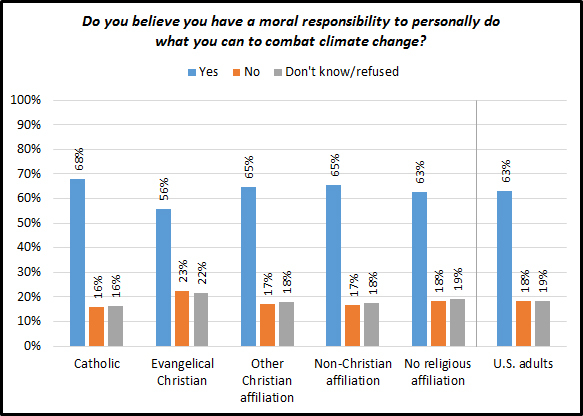 Catholics are also more likely than other adults to believe they have a moral responsibility to personally do what they can to combat climate change according to results from the poll conducted May 16 and May 26, 2016. Overall, 63% of U.S. adults agree that temperatures on Earth are getting warmer, on average, in response to higher concentrations of heat trapping greenhouse gasses like carbon dioxide and methane. Additionally, 24% neither agree nor disagree with this. Only 13% disagree. Sixty-five percent of adult Catholics agree with the statement regarding climate change, 12% disagree, and 23% neither agree nor disagree. Evangelical Christians are the least likely to agree with the statement at 51%. Seven in ten or more of those with a non-Christian affiliation (71%) or no Christian affiliation (70%) agreed with the statement. Sixty-seven percent of U.S. adults agree that increasing concentrations of heat-trapping greenhouse gasses in our atmosphere like carbon dioxide and methane are largely a result of human activity (e.g., industrial activity, transportation, as well as energy and food production). Twenty-one percent neither agree nor disagree with this. Only 10% disagree. 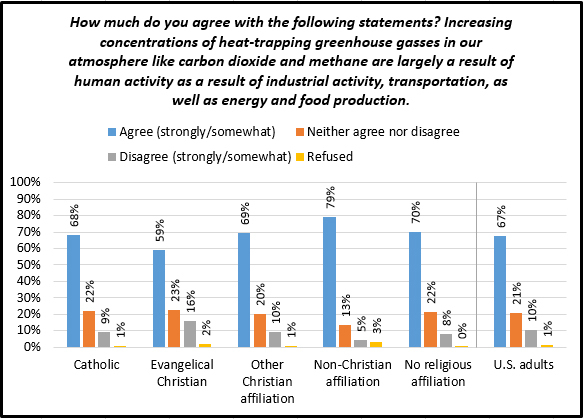 Sixty-eight percent of Catholics agree that increasing concentrations of heat trapping gasses is largely a result of human activity. Evangelical Christians are the least likely to agree that this is the case (59%). Other Christians have similar levels of agreement with the statement as Catholics (68%). Seven in ten or more of those with a non-Christian affiliation (79%) or without an affiliation (70%) agree. 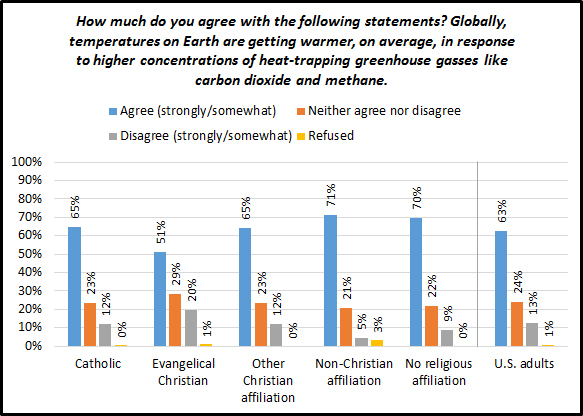 Sixty-percent of Catholics agree with both statements (strongly or somewhat) that the planet is becoming warmer in response to higher concentrations of heat-trapping gasses and that the increase in these gasses is largely a result of human activity. A minority of Evangelical Christians agree with both statements (46%). Catholic attitudes are similar to that of all U.S. adults combined. 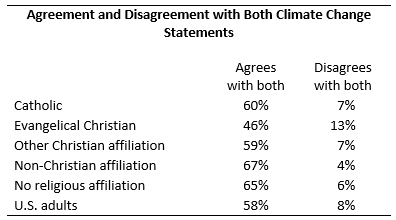 However, level of agreement with both statements is higher among those with a non-Christian affiliation (67%) or without an affiliation (65%). Note that disagreement levels are much lower and many choose to neither agree nor disagree with the statements. Twenty-eight percent of U.S. adults recall that they heard or read about Pope Francis’ encyclical on the environment a year ago. Generally, the public has low awareness of specific papal statements and are often more generally aware of what the Pope has been saying or how he has been appearing in the news. Questions about specific documents often have low awareness. The Associated Press conducted a survey in March 2015 asking the public if they were aware that Pope Francis was about to release an encyclical about global warming. At that time, 6% of adults indicated an awareness of this. In July 2015, after the release of Laudato Si’, the Associated Press found that 31% had heard of the encyclical. The current survey, a year later, shows awareness has fallen just a few percentage points over time. Catholic recall of the encyclical is only slightly higher than the general public at 32%. 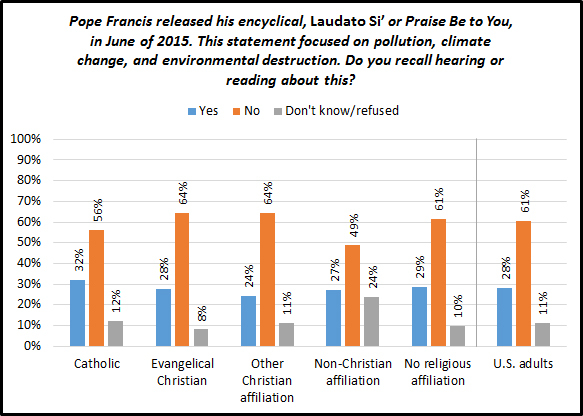 Majorities of all group say they don’t recall of hearing or reading about Laudato Si’. “Strong” agreement with the two statements about climate change, that the Earth is warming and that this is largely a result of human activities, is about 15 percentage points higher, on average, among those who recall hearing or reading about the encyclical compared to those who do not recall this. Only about 22 percent of U.S. adults say they think they generally agree with Pope Francis about the environment and climate change. However, even fewer say they do not agree with him on this topic (19%). 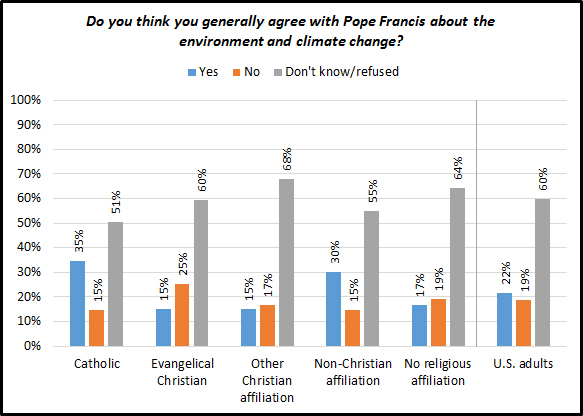 Given that only 28% of adults are aware of the Pope’s encyclical it is not surprising that most say they “don’t know” if they generally agree with Pope Francis on this issue. Catholics are the most likely to be sure of their agreement (34%), however half say they “don’t know.” Only 15% of Catholics are sure they are in disagreement. Among those who say they generally agree with Pope Francis about the environment and climate change, agreement (strong or somewhat) that the Earth is warming and that this is largely caused by human activity are comparatively higher than those who say they know they are not in agreement with Pope Francis (88% compared to 28% on warming and 90% compared to 39% on the link to human activity). This result is also evident among Catholic adults based on their assessment of their agreement with Pope Francis (86% compared to 28% on warming and 87% compared to 32% on the link to human activity). 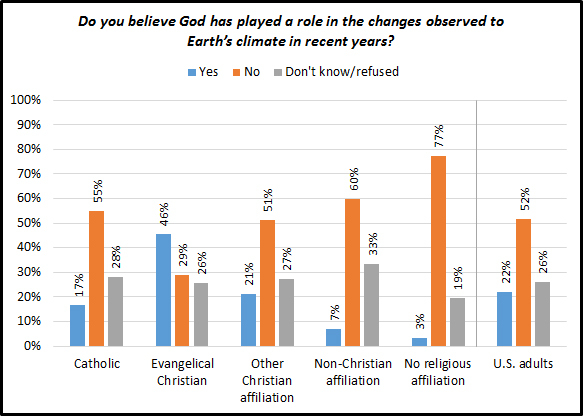 More than one in five adults, 22%, in the United States believe God has played a role in the changes observed in Earth’s climate in recent years. Even fewer Catholics believe this (17%). Evangelical Christians are most likely to agree that God has played a role with more than four in ten responding “yes” (46%). Note that a quarter responded “don’t know” or refused rather than yes or no (26% of all adults and 28% of Catholics). Respondents who said they believe God has played a role were asked the open-ended question, “What role do you believe God has played in recent climate changes?” Although 22% said they believed this, only 14% decided to respond to the open-ended question asking them to describe God’s role. Many responses cite one of two concepts: that this is all part of God’s plan or that God has control of everything that is happening. A representative sampling of these responses are shown below. All changes are part of His plan We do not need to know, or even understand the plan. As stated in Bible there is a end. Because he is the creator of all things. He controls everything. Every thing is created by God whether it be good or bad. God already knows everything that has and will happen, He gives us a free will to make our choices, but He also knows what we will choose. He knew the climate would change and knows what will come of all of it. He will direct as He feels fit to do. God created a universe containing the earth and it's life (plants, animals...), which has a natural evolutionary process, which includes climate changes. God is in complete control of all that happens, either by His active will or by his permissive allowance. God set up a climatology system that has naturally occurring cycles. It repeats over time. There have been many slightly cooler periods, just as there have been many slightly warmer periods. This is nothing new. I believe that God can do anything he wants to do. The Bible describes the times of "Jacobs troubles." Weather will get increasingly worse, just as famine, death, disease etc. will. Fewer than one in ten of those who believe God has played a role, say they don’t know or are not sure of what that role has been. Fourteen percent of all adults believe that climate change is the “most important” problem facing the world today. Catholics are more likely than others to say climate change is the most important problem (18%). A majority of U.S. adults and Catholic adults believe it is either the “most important” problem or a “very important” problem (60% and 66%, respectively). Evangelical Christians are the least likely to say climate change is the “most important” or a “very important” problem (10% and 39%, respectively). More than one in five Evangelicals combined say it is either “a little” or “not at all” important of a problem (12% and 10%, respectively). Sixty-three percent of U.S. adults and 68% of Catholic adults say they believe it is their moral responsibility to do what they can to combat climate change. Majorities of all religious sub-groups agree with this statement. Respondents who recall hearing or reading about the Pope’s encyclical are slightly more likely than those who are sure they did not to say they believe they personally have a moral responsibility to combat climate change (72% compared to 65%). This gap largest among those without any religious affiliation (83% who recall the encyclical compared to 62% who do not). Catholic respondents were asked directly about how the statements of Church leaders had impacted their belief that they have a moral responsibility to combat climate change. Nearly a third of Catholics, 32%, say statements by Pope Francis led them to strengthen their belief that they have a moral responsibility to what they can to combat climate change. Catholics are less likely to indicate statements by their pastor (19%), bishop (17%), or some other person in Church ministry (17%) had led them to strengthen their belief in their moral responsibility to combat climate change. Note that responses to this question are dependent on their bishop, pastor, or other Church minister making a statement about climate change. Respondents were also asked about their beliefs that society should take steps to address human-caused climate change. 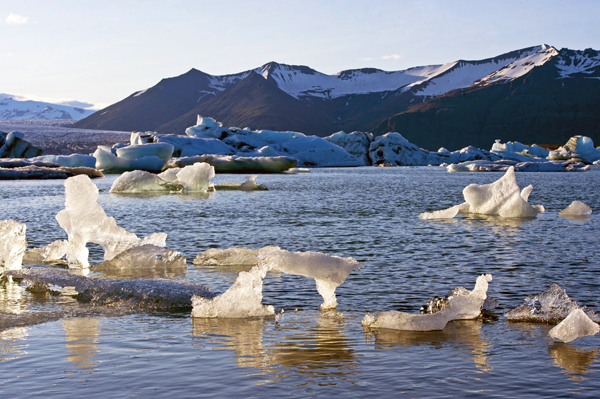 Overall, 72% believe society should take steps to combat climate change. Note this is higher than the share who believe they personally have a moral responsibility to do so (63%). Majorities of all religious sub-groups believe society should be taking steps to combat climate change. This is also the case whether each sub-group recalls hearing or reading about the Pope’s encyclical or not. 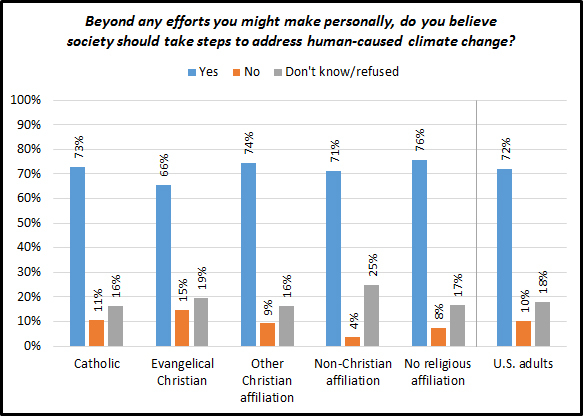 However, among respondents with no religious affiliation there is a noticeable gap where 95% of those who recall hearing or reading about the Pope’s statement believe society should be taking steps to combat climate change compared to 77% who do not recall hearing or reading about this. Among Catholics there is no difference between those recalling reading or hearing about Laudato Si’ and those who are sure they did not read or hear about this. It may be possible that the Pope’s encyclical has had a greater impact among those without a religious affiliation than Christians, and specifically Catholics. The data may indicates that Pope Francis has strengthened the case that individuals and society have a moral responsibility to act against climate change among those who are among the least religious in the United States. One aspect of the Catholic Church that the public, and Catholics specifically, appear to get wrong about the Church and climate change is the perception that Pope Francis is the first pope to address the Church’s position on the environment and climate change. In fact his predecessor, Pope Emeritus Benedict XVI was often referred to (including by National Geographic) as “The Green Pope.” It is also the case that Pope Saint John Paul II was also vocal about Catholics needing to respect and protect nature. 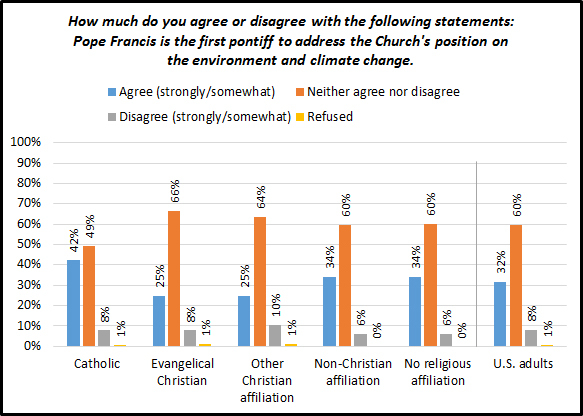 Yet, 32% of all adults agree (strongly or somewhat) that Pope Francis is the first in the Church to address the environment and climate change—including 42% of Catholic adults agreeing with this statement. Again, given the general low awareness of specific statements made by popes, it is likely the case that Catholics and non-Catholics alike are so much more aware of Laudato Si’ than something Pope Emeritus Benedict XVI or Pope Saint John Paul II said or wrote about the environment that gained less attention by the media that they believe Pope Francis is the first pontiff to address this topic. CARA partnered with GfK Custom Research (formerly Knowledge Networks), a highly respected polling firm that has assembled and maintains a large national panel of U.S. households using random probability sampling to conduct the survey. GfK was founded by academic social scientists and its methodology is highly rigorous. Their surveys are regularly used in academic research that is published in peer-reviewed journals in a variety of fields as well as by journalists and the government. Contacted initially by phone (random digit dial) or mail (randomly), each participating household in the national GfK panel of households agrees to be available for online surveys. The panel is not restricted to existing computer and/or Internet users. Those persons who are sampled and asked to join the GfK panel are supplied with subsidized internet access or a television appliance to take self-administered on-screen surveys. Thus respondents take surveys on computers, televisions, tablets, or smartphones. CARA surveys in English or Spanish at the respondent’s choice. These methods ensure that GfK’s panel is reflective as possible of the national population. The panel’s coverage of the population is very high, 97 percent, well above standard telephone polling methods. Interviews were conducted with 1,927 respondents between May 16 and May 26, 2016. The primary sample includes 1,010 self-identified Catholics. Additionally, 917 non-Catholics were interviewed. Of the non-Catholics, 311 are Evangelical Christians. Another 357 have some other Christian affiliation. A total of 76 had some other non-Christian affiliation and 167 had no religious affiliation (including 81 with no religion and 86 who are atheists or agnostics). Six respondents declined to state a religious affiliation. Statistical weights, created by GfK, are used to approximate the results for the U.S. adult population. A more complete description of the study and its methodology is here. For additional information about the survey contact me at mmg34@georgetown.edu or 202-687-0885. Image courtesy of United Nations Photo.